Illegal Logging in the Brazil Amazon: From past to present, What are the actions and realities? The European Union Forest Law Enforcement Governance and Trade (EU FLEGT) defines Illegal logging as situations where timber is harvested, processed, transported, bought or sold in contravention of national and international laws and which has devastating impacts on forests and forest dependent peoples. 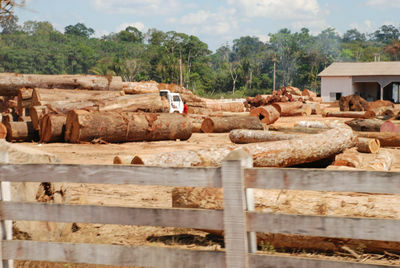 An assessment by Greenpeace International in the Amazon adds that timber may be illegal because it comes from land on a private estate that has been clear-felled without a deforestation authorization permit, or logged without a logging authorization - Autorização de Exploração Florestal (AUTEF); because it has been harvested in excess of the maximum authorized for a given area; or because it has been taken without permission from public land, or even from areas protected for wildlife or indigenous peoples and other communities. Different sources have provided estimates of forest ownership in Brazil as between 68% and 81% to be publicly owned and this includes indigenous lands where the remaining part is owned by communities. The International Tropical Timber Organization (ITTO) in 2011 presented the status of Brazilian Amazon forest to have over 60% being Permanent Forest Estates (PFE), i.e. land, whether public or private, that is secured by law and kept under permanent forest cover.. Only Brazilian-based community associations, cooperatives and companies can hold forest concession licences. IBAMA (Institute for the Environment and Renewable Natural Resources) is the Brazilian environment agency and has general authority over forestry licences but in 2006, new forestry legislation passed much of the responsibility for the logging industry to the State Environmental Secretariat - SEMA. Forest Managers and harvesting companies harvesting native species from planted forests must inform IBAMA or the state environment agency about their commercial activities. Also, forest managers and companies harvesting exotic species from planted forests need planting licences before a planted forest is raised. There is no doubt that illegal logging is a pervasive problem, causing enormous damage to forests, to forest peoples and to the economies of producer countries. After concerns and clear evidence of illegal logging in the Brazilian Amazon, the Brazilian Environmental Crime Law was enacted in 1998 with increased governmental efforts. Enforcement against illegal logging has improved but deforestation is still increasing. Brazil was recorded as the world leader in forest loss from 2000 to 2005 through illegal logging and deforestation. Brazil is a leading producer, processor and consumer of wood-based products for which the majority of the country's log production comes from the less than 2% area of forest lands and as well account for nearly all the country's exports to the EU, China, US and Japan. There are many factors to be assessed when considering illegal logging: increasing national population, indigenous peoples' property rights, industrialization around the world as well as reports on increasing forest degradation among states in the Amazon. There is the need to delve into these realities in assessing efforts to combat illegal logging. Investigative research has to ascertain whether or not there are underground activities fueling cash, crime and contravention of laws. For example, an environmental official, who assisted illegal logging investigations by providing information for the arrest of some culprits and who was well-known for his aggressive enforcement of deforestation laws was shot dead in October, 2016 in the Brazilian Amazon. That execution gives evidence of danger for land defenders in this region. A major report released in September by the Indigenous Missionary Council (CIMI) indicates that there were 137 killings of indigenous people in Brazil in 2015, with the state of Mato Grosso do Sul recording the highest number (25 for the year). Much of the violence is due to land conflicts exacerbated by the government’s failure to demarcate indigenous lands, resulting in conflicts between large-scale farmers and indigenous people. Other reports indicate that there are 96 indigenous lands in Brazil, but only four have been demarcated and approved so far. Another 68 are classified with the status of "no action" according to CIMI. A high number of indigenous people also took their own lives, with 87 registered cases of suicide in 2015 by indigenous people. Though actions to curb illegal logging of mahogany are in place, a new species, Ipê (Handroanthus spp.) is highly sought after and thus drives loggers deeper in search of it. Also, exploring the progress made with tackling illegal logging in the Brazilian Amazon particularly from different sources show that there are realities rather than reported. Different tree species might have been illegally logged and traded but investigations by Greenpeace International and also reported by Chatham House assessments mention a prominent species, mahogany (Swietenia macrophylla) as the 'Amazon green gold'. Records for deforestation were higher in the 1990's, attributed to the international demand for mahogany. Working in remote forest areas, the loggers often use false permits, ignore limitations of legal permits, cut species protected by law and steal from protected areas and indigenous lands. These are often small or medium scale operations that are able to avoid detection because of the remoteness of the logging locations, the weak presence of the federal environmental agency, IBAMA, and a complex chain-of-custody in the cutting, hauling and transporting of the logs. Also, legally approved forest operations in the Brazilian Amazon commonly provide cover for illegal logging. Logs are frequently cut illegally up river, outside of approved operations and clandestinely floated downstream. Once past an approved operation, they are "legalised" with forged documents claiming that the logs were cut on the property of the forestry operation. How do scholars and professionals outside of forestry conceptualize the practice of illegal logging in Amazon-Brazil? 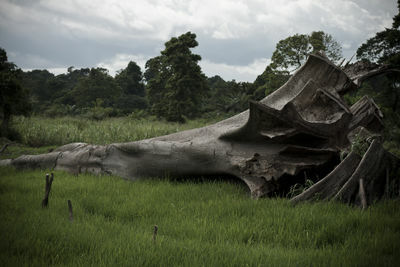 Illegal logging has significant impacts in various dimensions, including environmental, social, cultural and economic impacts. These impacts can lead to loss or degradation of forests and as illegal logging tends to be associated with poor forest management, it can result in the loss of habitats and biodiversity. It can also result in loss of significant government revenue and subsequently undermines efforts to place the forest sector on a more sustainable footing, as lost revenue cannot be reinvested in the sector. Another critical view is the fact that it distorts global markets and undermines incentives for sustainable forest management, as illegal timber is often cheaper than legal timber. Socially and culturally, it leads to corruption, conflicts with local communities and contravention of the rule of law. The Amazon rainforest is the largest on earth. Its biodiversity is unparalleled, it is crucial to the stability of the global climate, and it is home to many indigenous peoples. But in spite of its immense size and importance, the Amazon is also incredibly vulnerable. In the past three decades alone, human activity has destroyed an area of the Brazilian Amazon roughly the size of Germany. As climate change impacts are felt, there are concerns that the Amazon forest may reach a ‘tipping point’ in which it undergoes a rapid transition to savannah. The 2014 Intergovernmental Panel on Climate Change assessment reported that the probability of reaching this tipping point was increased by the combination of climate change and fragmentation acting together. Such a dramatic change would in turn lead to disastrous losses both of biodiversity and of vital ecosystem services currently provided by the forest, such as provision of clean water and climate regulation. Greenpeace Brazil in 2014, exposed how the logging company -- Agropecuaria Santa Efigenia Ltd -- logged, laundered, and sold over $7 million of illegal timber. The company filed fraudulent paperwork to claim ridiculously high quantities of valuable ipè timber from areas it could legally log. Then it used that documentation to launder illegal wood from other areas of the Amazon. Ipê is the most valuable Brazilian tropical timber species, and among the most expensive globally. While the volumes of Ipê harvested and exported have declined in recent years, the price continues to increase – driving loggers ever deeper into the forest in search of it. Much light is thrown here with emphasis on current prices; Unsawn log price (domestic): US$169.5 per cubic metre, Sawn timber price (domestic): US$859 per cubic metre, Sawn timber price (export, FOB Belem/Paranagua Ports): US$1,294 per cubic metre, Added value product– decking boards (FOB Belém/Paranaguá): US$ 2,330 per cubic metre. Now, almost a year later, Brazilian authorities have finally confirmed that Santa Efigenia engaged in large-scale fraud and have imposed sanctions on the company. The Brazilian Amazon alone is home to about 20 million people, including 400 different indigenous groups, and the future of the Amazon depends on the future of those that call the forest home. These people rely on the forest for their way of life. It provides almost everything from food and shelter to tools and medicines, as well as playing a crucial role in people's spiritual and cultural life. For example, the Waimiri Atroari of the Brazilian Amazon use 32 plant species in the construction of hunting equipment alone. Each plant has a specific role according to its physical and chemical properties. Yet the traditional way of life for indigenous Amazon cultures is being threatened. As logging companies move in, indigenous people are losing their traditional territory. Some indigenous people, such as the Deni living in a remote area of Brazil's Amazonas state, are working not only to protect their culture, but the forest and the diversity of life upon which they depend. As long as nation states remain powerful actors in natural resources allocation, regulation and management, political interference is an anticipated factor in any region and with consequent implications. The Brazilian Amazon is no exception in terms of forest management and timber production from states such as Para and Mato Grosso, which have a dual system of timber industry governance. This consists of a regulatory system that oversees the management of estates and the harvesting of timber and a chain-of-custody system intended to ensure trace-ability of timber from forest to user. Information gathered indicates that the governance system in public areas, indigenous lands and other protected and community lands is a major driver for illegal logging and markets can be flooded with illegal timber. Large amounts of illegal timber enter national and international timber markets after being laundered, using genuine documents obtained through fraudulent processes. What special expertise, resources, or theoretical orientations might others bring to help us better understand the implications associated with illegal logging in Amazon-Brazil? As a result of concerns about rapid deforestation and forest degradation around the world, there have been measures put in place to curb the process worldwide with the EU FLEGT as a specific example. Brazil is currently not identified among the negotiating or implementing VPA countries of the EU FLEGT In the Brazilian Amazon, IBAMA continues to conduct inspections of logging operations and timber consignments through monitoring of Sustainable Forest Management Plans. In Pará and Mato Grosso, the oversight of timber harvesting is exercised by the SEMA through the Integrated System for Environmental Monitoring and Licensing (Sistema Integrado de Monitoramento e Licenciamento Ambiental – SIMLAM), a computerised system by means of which estates are registered and monitored, and licences issued for their activities, including logging. To harvest timber, the landowner/operator must have a Logging Authorisation (Autorização de Exploração Florestal – AUTEF), issued by the SEMA via SIMLAM and valid for one year, with renewal possible for another year. This document generates credits for timber transactions within a chain-of-custody system and there must be an AUTEF associated with all timber sold or transported.In the Amazon. Harvesting is currently limited to 30m3 of timber which is equivalent to two to five trees, depending on species and size per hectare every 35 years. Bureaucratic management of forests and issue of licences. It appears that the state has more power over the overall management and use of forest resources in this region but with a complex system of engaging different stakeholders. Forest tenure and strands of secure property rights; the information I have been able to gather so far shows that a greater percentage of the forests is publicly owned and includes indigenous lands, with the rest being owned by communities. However, one can infer from this that there is a high probability of conflict of interest between the state management and indigenous people due to their different objectives and uses. For example, Greenpeace's research with indigenous communities has presented cases where some tribes have had land conflicts with some states in the Brazilian Amazon. Also, the idea of PFE mentioned above draws attention to a situation where underground activities may be carried out by some individuals at the expense of others. Another controversial finding is the obvious high production and use of wood nationally and internationally, claiming to be originating from plantations which constitute only a small portion -- about two percent of the forested area of the region. ↑ International Tropical Timber Organization (ITTO). 2011. Status of Tropical Forest Management. ITTO Technical Series No 38. ↑ Food and Agriculture Organization of the United Nations (FAO). 2005. Global Forest Resources Assessment, Rome, Italy.